At the risk of enduring the wrath of Indiana Jones fans around the globe, I will come right out and state that I believe Indiana Jones and the Temple of Doom to be quite a disappointment. 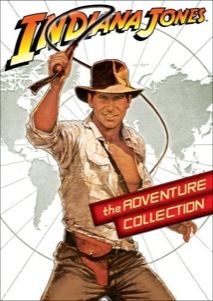 It certainly does have all the right elements of an Indiana Jones adventure�a breathtaking pace, thrilling action sequences, an interesting story, and, of course, Harrison Ford as the daring archaeologist, Indiana Jones. However, the film suffers greatly from a lack of direction. The story and subject matter are dark and somber while the dialogue is lighthearted and silly. The result is a somewhat exasperating experience. Temple of Doom takes place three years prior to the events in Raiders of the Lost Ark. Opening in a nightclub in Shanghai, we find Dr. Jones once again barely escaping with his life when he is poisoned by a nemesis in a deal gone sour. After a frenetic brawl in the club, Jones escapes on a cargo plane along with his new sidekick, a child named Short Round (Ke Huy Quan), as well as Willie Scott (Kate Capshaw), a songstress who reluctantly becomes caught up in the chaotic events at the nightclub. Little time passes before the plane crashes in India, where Jones, Short Round, and Willie find themselves answering to the pleas of the people in a remote village, whose children have been stolen along with a magical artifact. Soon, the trio find themselves on the way to Pankot Palace, where it is believed that the children reside as slaves under a cult named the Thuggee, long presumed extinct. Spielberg may be mostly to blame for the unevenness of Temple of Doom. George Lucas apparently wanted to create a much darker installment with Temple, and Spielberg was taken aback by Lucas' story involving black magic and gruesome cult ceremonies. As a way of counteracting the extreme subject matter, Spielberg inundated the film with playful moments that seem all too out of place with the story. In doing so, he has greatly narrowed the suitable audience for this film: Temple is far too intense and violent for children under twelve, yet much too childish for anyone over the age of fourteen. The characters are another reason for the ineptitude of Temple. Short Round is a frequently annoying presence that weakens the dramatic flow of the film. He has been inserted to appeal to the kids, yet I have no idea who the annoying Willie Scott is supposed to appeal to. She is obviously a weak attempt at comic relief, but I only found myself annoyed by her shenanigans. Gripes aside, Temple of Doom does have its impressive qualities. The movie is a marvel to gaze upon, as it boasts awe-inspiring cinematography and set design. I had not seen the film in its original 2.35:1 aspect ratio since its initial release in 1984, and I am amazed by how well Spielberg utilizes the widescreen frame. Much of the film is incredibly fun, complete with terrific action sequences such as the mine car chase, which is the cinematic equivalent of a theme park roller-coaster ride. My level of amusement is why I am granting Temple of Doom a mild recommendation. I did enjoy this second Indiana Jones adventure, even though I found it unbelievably exasperating. If they had eliminated the horrendous dialogue and the childish elements, Temple of Doom could have been a superior film. It may seem like blasphemy to the diehard fans, but I hope that technology will one day grant me with an "interactive" version of Temple of Doom, where I can create my own cut of the film as I see fit. Image Transfer Review: In similar fashion to Raiders of the Lost Ark, the visual quality of this 2.35:1 anamorphic widescreen transfer is excellent. Much of this sequel takes place in the dark, which could lead to a murky image, but that is not the case here. The black levels remain consistent, and the colors are especially sharp, even during the interior scenes. Paramount deserves serious credit for this very impressive presentation. Audio Transfer Review: Temple of Doom offers a loud 5.1-channel Dolby Digital soundtrack, but it's not always consistent. There's nothing overly problematic here, but the depth isn�t as sharp as I would have anticipated. The audio will keep you engaged, but it fails to provide the immersive experience of the best DVD releases. Extras Review: Marketed as a �Special Edition,� I expected to at least see a lengthy documentary, detailed interviews or deleted scenes. Sadly, this release includes none of these items and contains just three measly featurettes and some photo galleries. The Temple of Doom: An Introduction shows the creators trying really hard not to be too rough on this less-exciting picture. Spielberg calls himself a �director for hire,� with Lucas providing the darker vision that alienated some viewers. The Creepy Crawlies covers the entire trilogy and the snakes, bugs and rats that make life miserable for Indy and his pals. Animal Wrangler Jules Sylvester provides good details on each element, with particular attention paid to the snakes in Raiders. Finally, Travel with Indy: The Locations reveals brief details on the sites that covered for the international locations depicted in the films. The overall running time for the featurettes is about 28 minutes, with less than half actually discussing the Temple of Doom. There are four sets of photo galleries and a video game commercial, but I still would like to see much more. Lucas and Spielberg love to discuss their films, and sitting them down for a longer conversation would not have been a hard sell. This material barely scratches the surface of the abundant possibilities for this anticipated DVD. Instead of copying the classic Raiders of the Lost Ark, George Lucas and Steven Spielberg crafted a strange meld of slapstick and darker material, which delivered a mixed experience. This release offers few exciting features and isn't needed if you own the 2003 version. But the presentation is solid and should be enough if you're not looking for the definitive version of this uneven film.